At first sight Gerhard Berger doesn't appear a likely focus for Imola. Both Ayrton Senna and Alain Prost performed more impressively, just like Michael Schumacher. 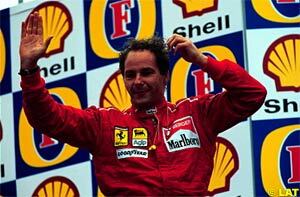 However, when you look behind the wins, Gerhard Berger has always been a remarkable driver in Imola. 13 participations, 6 finishes, 5 podiums and one of the biggest crashes from which a driver actually walked away. A look at 13 years of ups and downs of the perfect teammate. Berger's first race at Imola came in 1985 with Arrows. After some particularly good tests in the pre-season at Imola, which were then followed by two rather disappointing races, expectations for the Arrows team were on the rise again. The first practice session didn't quite show anything, other than that the Arrowses were capable of competing with fellow BMW users Brabham. Still, 16th place was not something Berger was very happy with. However, in the first qualifying session on Friday, things turned and both Arrows drivers rocketed up the charts. With Berger in fifth and his teammate Thierry Boutsen in sixth, there was more than enough reason to be happy. Sadly on Saturday, part of the joy was gone again. In a troubled session, Berger wasn't able to improve his time, driving a full second slower than the day before. With most of the drivers gaining two to five tenths of a second, Berger's overall position on the grid dropped to tenth. The warm-up on Sunday morning didn't help much either, as rain was pouring down. Once the race started, it was dry again, though. At the start, Berger immediately lost ground to Eddie Cheever in an Alfa Romeo and Ligier driver Andrea de Cesaris. In the next lap, the second Alfa of Riccardo Patrese also got the better of the Austrian, demoting him to 13th place. All of this wasn't too worrying yet, as in Imola it was often a case of finishing the race to obtain a decent result. That, however, wasn't the case for Berger. After just four laps, the BMW engine cut out, giving its helpless driver no choice but to sit out the race and try again next time. The next time Gerhard Berger came to Imola, the power source was still a BMW Turbo, but the chassis was a different one. The Austrian now drove for Benetton, which was until 1985 known as Toleman. Qualifying ended with a result similar to 1985: Berger put the Benetton ninth on the grid. After a tumultuous start, where Berger had to let his teammate Teo Fabi and Beatrice veteran Patrick Tambay past, the race settled. Bit by bit, the Austrian moved up. First Nigel Mansell dropped out, then Tambay, after which Berger successfully moved past Ferrari driver Stefan Johansson. After twelve laps, another veteran, Ligier's Rene Arnoux, dropped back and early leader Ayrton Senna (Lotus) retired. This put Berger in sixth place. Just after one third distance, Berger made his way past his teammate again and consistently ran in fifth for a fair part of the race. A little past the halfway point, Rene Arnoux's Ligier came up through the field again, passing Berger only to lose a wheel later on. However, Berger had problems of his own. With some thirty laps to go, his clutch failed, after which going through the gears became a real problem. Gerhard dropped back fast, only hanging in there by sheer will power. In quick succession, Brabham's Riccardo Patrese, fellow Benetton driver Teo Fabi and the revived Johansson passed the young Austrian. As the end approached, though, things quickly took another turn. First Fabi retired when his engine failed and then the aforementioned Rene Arnoux also retired, putting the struggling Berger back into seventh place. Then, in the final laps of the race, the big Imola fuel-preservation race started. With the maximum fuel usage now at 195 litres, instead of the previous 220, Imola required an eagle eye monitoring of the fuel load. The experienced Stefan Johansson took it easy in the final stages of the race, opting to finish behind Berger, rather than to run out of fuel and not finish at all. It became a smart decision for the Swede. The first one with no fuel left was Osella driver Piercarlo Ghinzani, who was already a long way behind. After that Michele Alboreto suffered a turbo failure, which put Berger in fifth place. Then both Patrese and Rosberg ran out of fuel with two laps to go. Alain Prost was now in the lead, followed by Nelson Piquet and with Berger in an amazing third place, a lap behind. As the race drew to a close, Berger saw Prost's McLaren fading on the final straight. In a brilliant tactical move, the Austrian got off the throttle and crossed the finish line two tenths behind Prost. While he could have easily passed Prost and still finish on the lead lap, Berger was smart enough to know that chances were big that he'd run out of fuel too in that final lap or that his gearbox could have easily failed after having been operated without the clutch for thirty laps. This bit of tactical thinking not only brought Gerhard Berger his first ever Formula One podium, but also awoke the interest of Ferrari. Berger indeed moved to the Scuderia for the following year. His first race on the team's home soil was one to forget. Qualifying went relatively well, with fifth place for Berger and sixth for Alboreto, which in retrospect was one of the few times in the first half of the season where the red cars started the race in a position to battle for the lead. As the race started, both Berger and Alboreto had good starts, passing Berger's former teammate Teo Fabi. Berger ran consistently in third, just behind Ayrton Senna and Michele Alboreto and closely followed by Patrese. However, his first start on Italian soil in an Italian car wasn't meant to have a finish attached. After only sixteen laps, Berger's electrical system failed to do what it was designed for and the unfortunate driver was forced to retire. In 1988 Gerhard was still with Ferrari, but the car was hopeless. Even though the power was available, there was an absolute lack of balance which rendered it virtually impossible to translate the technically available power into practically available power. Berger qualified fifth, like the year before, but the knowledge that the McLarens were in a galaxy of their own gave little hope for real success. Limited by the Ferrari's quite extreme thirst for fuel, Berger opted, or rather was forced to keep a steady pace and eventually even settle for a spot outside the points. In the end, though, points did arrive. Firstly, Patrese's Williams-Judd developed a number of problems, demoting its driver from sixth to thirteenth in a matter of laps. After that, Benetton's Alessandro Nannini also dropped back, leaving Berger to battle it out with Nelson Piquet in the Lotus and Thierry Boutsen in the second Benetton. In the end, Berger finished behind both drivers, a little over a lap behind both McLarens. A year later, little had changed. Berger was still at Ferrari and still qualified fifth at Imola. This was after having scored a provisional pole on Friday in the rain. At that time, Senna was the absolute master in the rain and even though the home crowd gave Ferrari a boost, it came as a huge surprise that Berger led qualifying halfway through. With a lap of 1:42.7, the Austrian was two tenths quicker than Senna, who in turn was one and a half second faster than his teammate Alain Prost. The rest of the field followed another second behind. Unfortunately for Berger and Ferrari, Saturday qualifying was dry and thus rendered the Friday result null and void. When the race started, Berger adopted his by now usual approach of settling in after the start, looking for good opportunities to gain places. This race settled particularly quickly, as the top six cars slowly moved away from the rest of the field, who were battling it out behind them. Berger settled in fifth and with Patrese a little ahead and Boutsen an equal distance behind him, there was little to worry about. The race would continue in a steady pace, the McLarens would drive away into the distance, cars would break down and Berger would finish third or fourth or something similar. At least that was the thought. However, a relaxing thought turned into an absolute nightmare reality within a few seconds. As Berger approached Tamburello more or less flat out, as usual, something on the Ferrari broke. Berger lost control of the car, heading straight towards the wall with its driver a horrified passenger. When it hit, the world was convinced it was all over for Berger. The car, which hit the wall at an angle, spun around like a whirlwind of bent metal, before finally coming to rest at the exit of the corner. Since only a few laps had been completed, the fuel tanks were nearly full, which was the reason that this already terrible crash turned into a nightmare that no eyewitness can ever forget. Immediately after the crash, the car was engulfed in flames, its driver trapped inside. 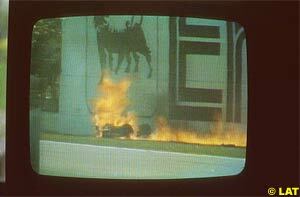 After an eternity that lasted for 23 seconds, the fire marshalls of Imola rescued Gerhard Berger from his car. Miraculously the Ferrari driver escaped with only minor burns. In 1990, Berger teamed up with Ayrton Senna at McLaren. The Austrian had already shown in the first two races of the season that he was quite on par with Senna in qualifying. This was ultimately confirmed in the first qualifying session at Imola. A mere five hundredth of a second separated the two, Berger leading. However, on Saturday Senna took charge and put in a lap half a second faster than his teammate. Nevertheless, it was a McLaren front row. When the race started, Ayrton Senna immediately took the lead, followed by Williams driver Thierry Boutsen and Gerhard Berger. Senna's lead didn't last long, though. After just a few laps, the Brazilian spun out of the race, leading Boutsen and Berger to battle for the lead. Following Boutsen closely, without really pressuring the Belgian, Berger was once again rewarded for his patience. After 17 laps, Boutsen blew his engine because of a gearbox problem, which forced him to rev higher than usual. Berger was now in the lead, followed by Patrese and Mansell. As the race progressed, it became more and more obvious that the presence of Patrese was very much helping the leader in the race. The Italian was too slow to follow, but for a long time too fast to let Mansell's Ferrari overtake him. Each lap, Berger's lead grew without Berger actually going any faster himself. However, once Mansell finally passed Patrese, he was quickly on his way to Berger. After 38 laps the Briton was right under the gearbox of the McLaren. When both drivers readied themselves for the Villeneuve corner, Mansell made his move. This, however, was not where and when Berger expected him to do it, so the Austrian took his normal racing line into the corner, before spotting the presence of Mansell. The Ferrari was forced onto the grass, where it spun and rejoined but soon ended its race, leaving behind a mad Nigel Mansell. Berger was able to continue, but as the end neared, Patrese came closer and closer and finally overtook him, denying Berger's first victory at Imola. The following year was pretty much a rerun, with the exception that Senna now was able to complete the race and Patrese wasn't. Quite a few drivers left the race after rain caused numerous spins in the early stages of the race. The victims in the first two laps were quite some names: Alain Prost, Nigel Mansell, Jean Alesi and Nelson Piquet. With no competition left, the McLarens finished an easy one-two with a gap of almost two laps to third placed JJ Lehto in a Dallara. In 1992, Berger's final year with McLaren, things again were pretty uneventful for most of the weekend. Berger qualified fourth behind the three obvious cars of Senna and both Williamses. He ran his race mostly in fourth, until Jean Alesi in the Ferrari passed both McLarens. Ayrton Senna then passed the Frenchman again, at which point Berger saw the gap and followed his teammate. Alesi didn't expect two cars at once and promptly touched Berger. As both cars spun, they hit each other again, now ending both their races. The year after that, Berger and Alesi became teammates at Ferrari. This was the start of one of the longest lasting teammate relationships ever in Formula One. Sadly for Berger, his return to Maranello came at a time when the team was possibly at its worst. The car just wouldn't go and that showed at Imola too. An eighth place in qualifying wasn't even too bad in the end. Come race day, Berger had a superb start from eighth to fifth, past Karl Wendlinger and Michael Andretti, while Mark Blundell didn't even complete the first lap. After a mere eight laps it was over for Berger, as his gearbox failed. In 1994, things went a little better at Ferrari. Behind the Benettons and Williamses, they were more or less competitive, which resulted in a third spot on the grid for Berger. Normally third would have been reason to celebrate, but not in this blackest weekend of Formula One. During the second qualifying session, Roland Ratzenberger, a fellow Austrian driving for the small Simtek team, suffered a fatal crash. This crash hit Berger very hard, as Ratzenberger was a younger driver he knew quite well. After eight years, death was at once very real for Formula One drivers. On race day, it became even more real. In a flash, Berger's good friend Ayrton Senna went off in the same corner where Berger himself had suffered the worst crash of his career. This time the miracle didn't happen and Gerhard Berger and all the world lost one of the very best. Within 24 hours, Gerhard Berger had lost two good colleagues and two good friends. Nobody in the world would have been surprised if the Austrian had retired there and then. Instead, he continued and played an important part in the reforming of the Grand Prix Drivers' Association. The return to Imola was quite a success by 1995 Ferrari standards. Berger qualified on the front row and eventually finished the race in third, with clutch problems. 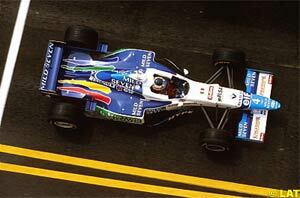 After that, Berger moved with Alesi, from Ferrari to Benetton. Again he moved to a team on the way down, but just like Alesi he made the best of it. In 1996 he moved from seventh on the grid to a well earned third place. His final race at Imola then, in 1997, gave Gerhard Berger's career at Imola an unworthy ending. After having qualified eleventh in the struggling Benetton, he only lasted four laps in the race, before the car spun on him. What should have been a party, since it was Berger's 200th Grand Prix, ended in yet another disappointment. 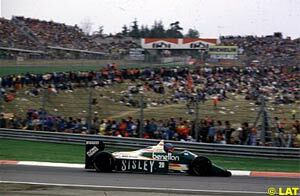 In a way, that final race was typical of Gerhard Berger at Imola. Usually up there when his material would allow him, but in the end always lacking that extra bit of luck to grab the win. Thankfully, Berger had his luck when he needed it most, back in 1989 in Tamburello. During his thirteen outings in the San Marino Grand Prix, Gerhard Berger, who entered Formula One as a bit of a wild child, demonstrated very well that a good result can be obtained by staying patient and not trying to be the fastest in every single lap when you know there's little luck to be had. Maybe now, with Berger back at BMW, one of his Williams boys will pick up the win he has been looking for so long.